There is a need for information on the environmental persistence and toxicity of alternative residual herbicides such as s-metolachlor and pendimethalin before a full assessment of the benefits and disadvantages of their increased use can be made. Management of herbicides must always take into account effective, integrated weed management so as to avoid a weed outbreak and the need for further herbicide use. Paddock scale models are important tools in assessing land management practice effects on the water quality of runoff from farms. The HowLeaky crop and water balance model has been updated to include a pesticide dissipation and transport model which predicts the runoff loss of pesticides from a paddock. Under best management practice guidelines, reduced reliance on the use of ‘residual' herbicides in favour of ‘knockdown' herbicides is considered an improved farming practice. Residual herbicides are applied pre-emergence to prevent seeds germinating and/or emerging and, as such, are required to persist for a period of time after application. Knockdown herbicides are used to kill emerged weeds and, therefore, generally have shorter half-lives in soil than residual herbicides. Commonly applied residual herbicides are the photosystem II (PSII) inhibiting compounds which are frequently detected in Great Barrier Reef waterways and in the Great Barrier Reef lagoon: atrazine, diuron, hexazinone and ametryn (Lewis et al., 2009, Shaw et al., 2010). Using the pesticides model in HowLeaky, a comparison was made of the potential offsite losses of a range of herbicide products: PSII residuals (atrazine and diuron), knockdowns (2,4-D and glyphosate) and emerging (newly developed) herbicides (s-metolachlor, isoxaflutole and pendimethalin). Herbicides were applied according to best pesticide (B class) management for cane in the Mackay Whitsunday region involving limited use of residuals in both plant and ratoon cane, with weed control achieved through increased use of knockdown herbicides. In this scenario, the ‘emerging' herbicide s-metolachlor replaced an application of traditional residual herbicides in the plant cane. The herbicide management practices were modelled on a legume fallow followed by plant cane and four ratoons under zero tillage with green cane trash blanketing (Shaw et al. 2011). The bar graph below shows annual average annual runoff loads (grams/hectare/year) for residual, knockdown and emerging herbicides. In this scenario, all pesticides were applied on the same days at label rates with only one application per year on the same day. This application scenario is unrealistic; however, it provides a direct comparison of the effect of the herbicides on loss in runoff. 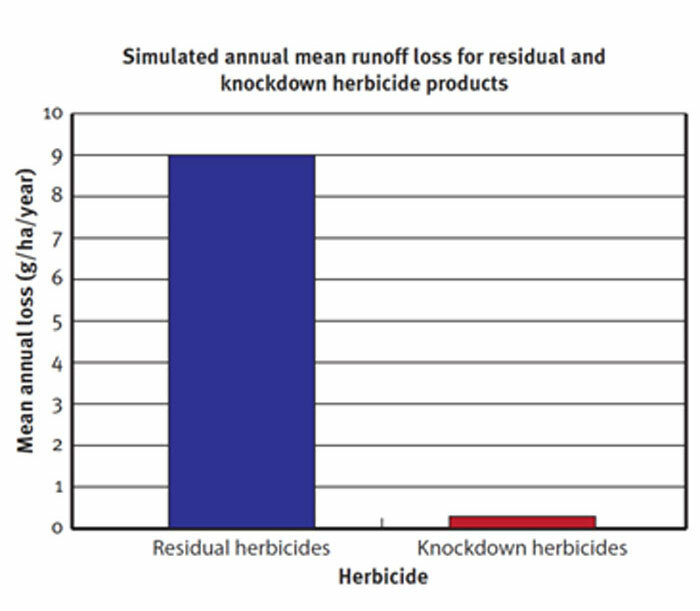 Concentrations in runoff of the knockdown products were notably lower than for the residual herbicides. For example, the average daily 2,4-D concentrations were more than 100 times lower than for diuron. Similarly, runoff concentrations of the emerging herbicide isoxaflutole were more than 500 times lower than for diuron and atrazine. Applications of s-metolachlor and pendimethalin resulted in average runoff concentrations higher than for atrazine, but still lower than for diuron. S-metolachlor and pendimethalin are both relatively toxic to aquatic plants and other aquatic organisms, although they are not classed as PSII inhibiting herbicides. 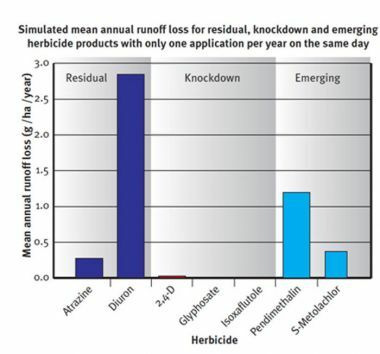 Graph showing simulated mean annual runoff loss for residual, knockdown and emerging herbicide products with only one application per year on the same day. The bar graph below shows annual runoff losses for a more realistic application scenario for best management practice (B) on cane in the Mackay Whitsunday region. Under this scenario, the total amount of knockdown herbicides (glyphosate and 2,4-D) lost is still significantly lower than the amount of the residual herbicides (atrazine and diuron). Differences in the relative mean annual losses of herbicides observed between scenario one and scenario two reflect the number of applications simulated for individual products and the timing of those applications relative to rainfall events. These results are supported by the Comparing runoff loss of knockdown and residual herbicides in the Herbert catchment and the Comparing residual versus knockdown herbicides in sugarcane in the Mackay regioncase studies. This study represents a simplified investigation of this issue; however, it demonstrates the utility of the HowLeaky simulation model. Melanie Shaw and Mark Silburn (Queensland Government Department of Natural Resources and Mines). Lewis S, Brodie J, Bainbridge Z, Rohde K, Davis A, Masters B, Maughan M, Devlin M, Mueller J, Schaffelke B (2009). Herbicides: a new threat to the Great Barrier Reef. Environmental Pollution 157, 2470–2484. Shaw M, Furnas M, Fabricius K, Haynes D, Carter S, Eaglesham G, Mueller JF (2010). Monitoring pesticides on the Great Barrier Reef. Marine Pollution Bulletin 60, 113-122. Shaw M, Silburn DM, Thornton C, Robinson B, McClymont D (2011). Modelling pesticide runoff from paddocks in the Great Barrier Reef with HowLeaky. MODSIM 2011, Perth WA.